I am doing some work building a capability ecology for an organisation. A strategic conversations group has been formed to explore strategies for making a positive difference in the sustainability impacts of the organisation. The brief includes looking at depletion, pollution, exploitation, extraction, displacement, consumption, globalisation, discrimination, confusion and dislocation at a global scale. Fun topics. The other part of the brief is to turn this around to examine the positive reversal of these dynamics beginning with the organisation's own spheres of responsibility. In looking at the Messages for 2100 in the time capsule of the remarkable minds interviewed in the 11th Hour, the conversations group made an observation on the different stages of engagement with these issues. They noticed how we (as a humanity) are transitioning into different change phases, in different places, at different times. The patterns were clearly discernible for them. This recalled for me how Elisabeth Kubler-Ross' integrative work on Death and Dying (1969) has been applied to organisational systems undergoing a transformational change in identity and raised the question of what might this same dynamic look like in the social system that is humanity. 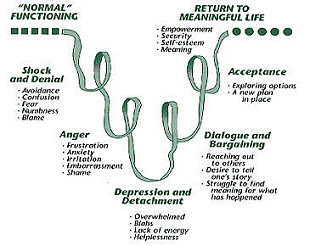 Recalling the stages once more, they are Shock, Denial, Anger, Depression, Bargaining, Acceptance, Decathexis, with Hope underlying and supporting the entire transition. If we examine the global response to not only climate change, but the emergence of a global ethic of the health of the commons - we can see waves of concurrent unfoldment in the discernible stages of the grief cycle. What is the entity that is dying here? Is it human life as we know it and the biota in which it is in symbiosis? Or is it the identity of mankind as the bounded rationality of separation refinds itself reborn in new identification with the greater commons? Perhaps the reframe is from the death and dying - to life and living. The object of our identification might be what defines either loss or birth. I myself am an optimist in that transition, recognising the stages of grief and regeneration needed which are there to be seen (should we care to look). I also understand that someone will have to be there to 'hold the hand of the dying and kiss the tears of the crying' as this path unfolds in hope.